The Jellyfish Nebula (officially known as IC 443) is a supernova remnant about 5,000 light years from Earth. Astronomers have been looking for the spinning neutron star, or pulsar, from the explosion that created the remnant. 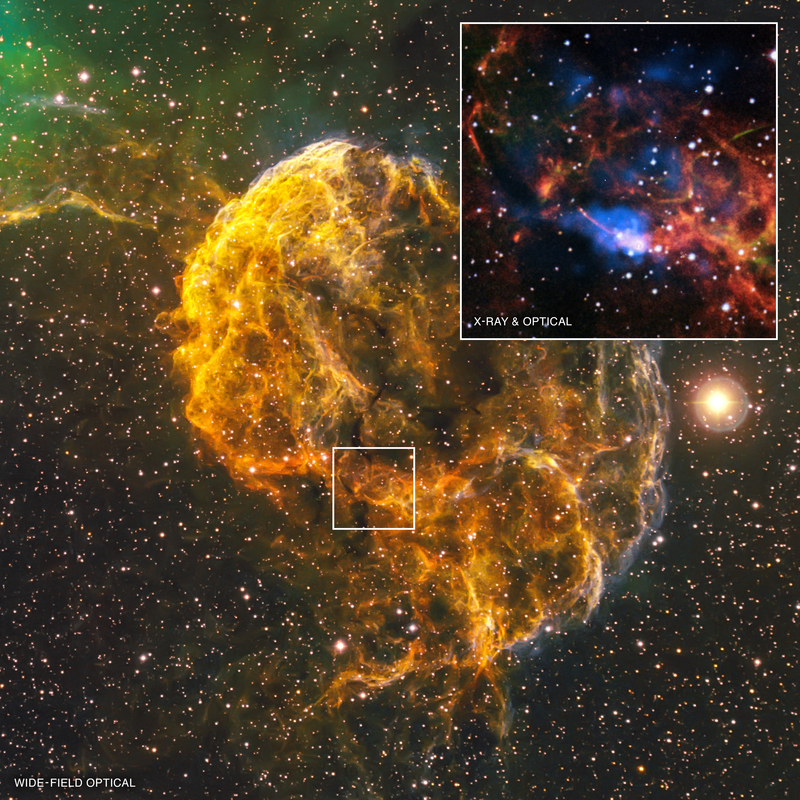 New Chandra observations have likely spotted a pulsar on the southern edge the Jellyfish Nebula. The X-ray data also provide new details about the structure and properties of this pulsar. The Jellyfish Nebula, also known by its official name IC 443, is the remnant of a supernova lying 5,000 light years from Earth. New Chandra observations show that the explosion that created the Jellyfish Nebula may have also formed a peculiar object located on the southern edge of the remnant, called CXOU J061705.3+222127, or J0617 for short. The object is likely a rapidly spinning neutron star, or pulsar. When a massive star runs out of thermonuclear fuel, it implodes, forming a dense stellar core called a neutron star. The outer layers of the star collapse toward the neutron star then bounce outward in a supernova explosion. A spinning neutron star that produces a beam of radiation is called a pulsar. The radiation sweeps by like a beacon of light from a lighthouse and can be detected as pulses of radio waves and other types of radiation. This new composite image includes a wide-field view from an astrophotographer that shows the spectacular filamentary structure of IC 443. Within the inset box, another optical image from the Digitized Sky Survey (red, green, orange, and cyan) has been combined with X-ray data from Chandra (blue). The inset shows a close-up view of the region around J0617. 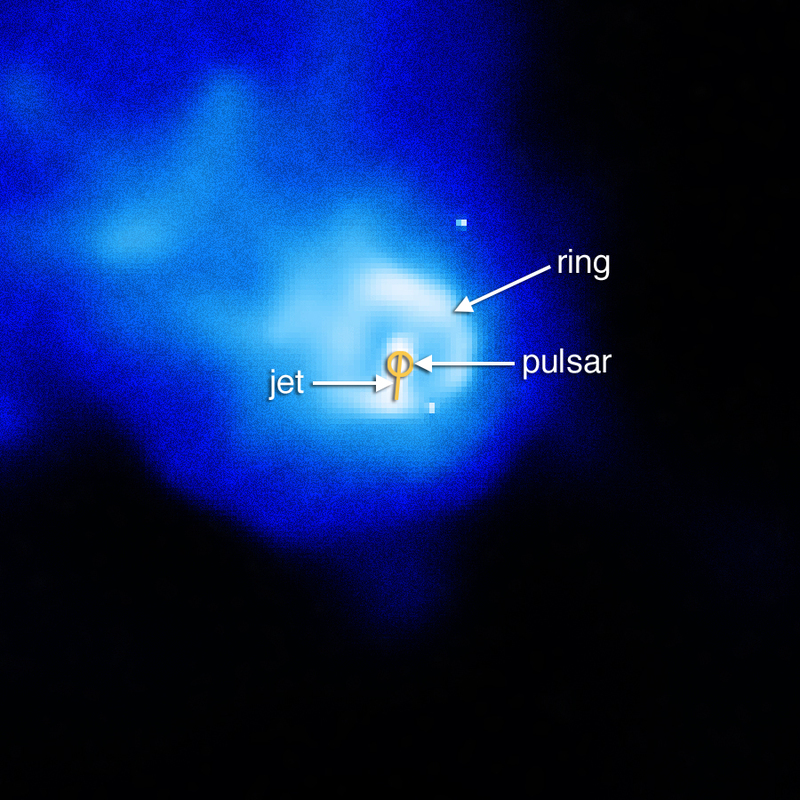 The Chandra image reveals a small, circular structure (or ring) surrounding the pulsar and a jet-like feature pointing roughly in an up-down direction that passes through the pulsar. It is unclear if the long, pink wisp of optical emission is related to the pulsar, as similar wisps found in IC 443 are unrelated to X-ray features from the pulsar. The ring may show a region where a high speed wind of particles flowing away from the pulsar, is slowing down abruptly. Alternately, the ring may represent a shock wave, similar to a sonic boom, ahead of the pulsar wind. The jet could be particles that are being fired away from the pulsar in a narrow beam at high speed. The X-ray brightness of J0617 and its X-ray spectrum, or the amount of X-rays at different wavelengths, are consistent with the profiles from known pulsars. The spectrum and shape of the diffuse, or spread out, X-ray emission surrounding J0617 and extending well beyond the ring also match with expectations for a wind flowing from a pulsar. The comet-like shape of the diffuse X-ray emission suggests motion towards the lower right of the image. As pointed out in previous studies, this orientation is about 50 degrees away from the direction expected if the pulsar was moving away from the center of the supernova remnant in a straight line. This misalignment has cast some doubt on the association of the pulsar with the supernova remnant. However, this misalignment could also be explained by movement towards the left of material in the supernova remnant pushing J0617's cometary tail aside. This latest research points to an estimate for the age of the supernova remnant to be tens of thousands of years. This agrees with previous work that pegged IC 443's age to be about 30,000 years. However, other scientists have inferred much younger ages of about 3,000 years for this supernova remnant, so its true age remains in question. These findings are available in a paper published in The Astrophysical Journal and is available online. The authors are Douglas Swartz (Marshall Space Flight Center), George Pavlov (Penn State University), Tracy Clarke (Naval Research Laboratory), Gabriela Castelletti (IAEF, Argentina), Vyacheslav Zavlin (MSFC), Niccolo Bucciantini (INAF, Italy), Margarita Karovska (Smithsonian Astrophysical Observatory), Alexander van der Horst (George Washington University), Mihoko Yukita (Goddard Space Flight Center), and Martin Weisskopf (MSFC). Coordinates (J2000) RA 06h 17m 05.00s | Dec +22° 21' 30.00"
Observation Time 42 hours 13 min (1 day 18 hours 13 min). About 5,000 light years from Earth. 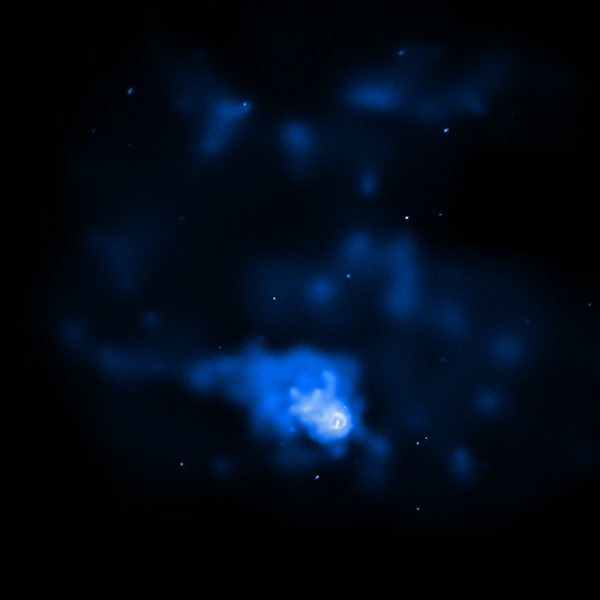 X-rays from Chandra and optical image from the Digitized Sky Survey. Wide Field about 100 light years; Inset about 10 light years. Wide Field Optical red, green and blue; Inset: Optical red, green, orange and cyan, Inset: X-ray blue.